Tuesday, May 26 was a big day. First, we met in class and discussed travel plans and Dower’s historical book, A War Without Mercy. That was the day we talked about how race influenced the way in which Americans viewed the Japanese during WWII. This was a very valuable discussion for me in particular because for my final research project I am looking at Japanese perceptions of Japan in response to globalization. By learning about how America perceives Japan I can gain a deeper insight into the kind of position Japan had in the international sphere from a historical standpoint. The racially charged viewpoint of Japanese as vermin or lesser has shifted over time and so it is good to see some of the original misconceptions and how modern perceptions have developed from this old view of Japan. For example, the Japanese people were dehumanized during the war by being represented as monkeys, rats, and other vermin needed exterminating. Dower called it “photocopies of the same person” and “an obedient mass with but a single mind” which made it easier for American soldiers to indiscriminately kill. 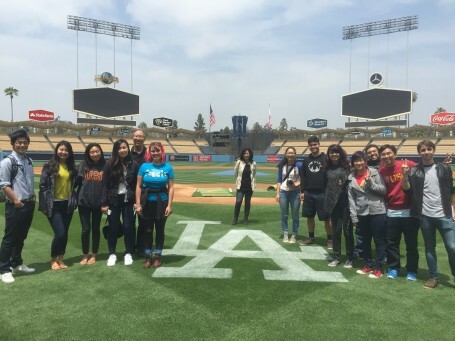 After the lesson, we went to Dodger Stadium and took a tour of the place. It was a really special thing to do as the stadium only offers two public tours a day! From learning more about the history of the Dodgers, we were able to understand how a traditionally American game opened up and accepted Japanese players and how there is a mutual respect for each other because of shared reverence of the game. This was a really interesting experience for me since I had never gone to a Dodger’s game or been to the stadium before! Once the tour was done we all went to speak with Mr. Scott Akasaki. He is a Japanese-American who went to live in Japan and through his passion for baseball, gained experience in the Japanese baseball field and was able to get a job focused around what he is passionate about. He told us about how rewarding it was to sign two Japanese players to the Dodgers as well as frustrating stories about the difficulty of translation and cultural difference. 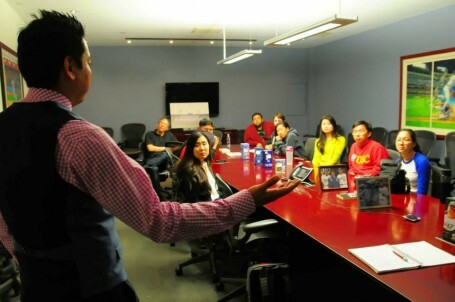 It was really inspiring to hear about how he learned Japanese and created his career path. The Japanese American National Museum was next on our list. We went to the Hello Kitty exhibit and saw how a tiny coin purse turned into an international icon for cuteness. Seeing how the Japanese Hello Kitty, or “Kitty-chan,” was able to warm the hearts of people around the world was very cool because it showed how the Japanese “cute” culture is accessible and attractive to people all around the world. Other than the Hello Kitty exhibit there was the permanent installment of the history of Japanese-Americans. This museum is so important because it shows what kind of struggles racial minorities face in America and acts as a home to the important history of the hybrid culture of Asian-Americans and specifically Japanese-Americans. Going to this museum was such an eye-opening experience. You can learn so much from the pieces and the people presented in it. If you’re ever in the Los Angeles area you should definitely check it out! Lastly we went to the Dodger’s game! After some quality ramen, we watched the ball game against the Atlanta Braves that night at Dodger Stadium. We beat them 7-0, it was a great game to see before leaving for Japan. While we’re in Japan we will be seeing another professional baseball game, so it will be interesting to see the difference in Japanese and American baseball. Overall, this was a fun-filled, insightful day where we got to not only learn more about Japan and American cultures, but also about Los Angeles itself by going to all of these different places this amazing city has to offer! This entry was posted in Class, Exploring, Los Angeles by geajapan. Bookmark the permalink.